Lots of readers these days share the feeling that fiction, specifically apocalyptic fiction, best captures the mood of these precarious times. I say that and yet I'm not usually drawn to apocalyptic fiction. It's often somber and violent and I guess I'd rather read stories where things get better rather than worse. Ling Ma's Severance, however, is an unusual apocalyptic novel. Satiric and playful — as well as scary — it lends readers the assurance that humor will linger even as the world winds down to an end. The premise of Severance is that America and much of the rest of the world has been struck by something called Shen Fever — a fungal disease that originated in the factories of Southern China. Once infected, "the fevered," as they're called, forget to eat or bathe; instead, they "loop indefinitely," until they die, performing rote tasks like folding sweaters or vacantly turning the pages of a book over and over. The narrator who's describing this horror for us is named Candace Chen. Candace is a rootless first generation American. Her parents, who emigrated from China, are dead and, after college, Candace moved to New York, telling us she was, "carried by the tides of others." Eventually, Candace landed a job supervising the production of made-to-order Bibles like "the Outdoors Bible, housed in a lightweight steel case. ... [and] the Alternative Bible, featuring a blank cover and packaged with Sharpie markers for the alt-Christian teens to decorate however they want." Five years limp by, during which time Candace sustains a tepid relationship with her slacker boyfriend in Brooklyn and also curates her photo blog called NY Ghost that she fills with images of forgotten sites in the city. The irony is that when Shen Fever hits and Candace, for lack of better options, accepts an enormous bonus to stay in New York and keep the corporate headquarters open, NY Ghost becomes a vital link for survivors around the world to see updates from the increasingly empty city. When Candace finally rouses herself from her passivity, she's startled to realize that she may well be the last uninfected person in New York City. That's when she steels herself to walk through the mile-and-a-half, pitch-dark Lincoln Tunnel to escape to the mainland of New Jersey. Those events take place in flashbacks to the opening years of the 21st century; in the present-time of Severance, 2005 or so, Candace has already fallen in with a small band of survivors, all apparently immune to Shen Fever, who shelter together in a colossal midwestern shopping mall, availing themselves of the staples of the food court and the pungent cleansers in Bath & Body Works. But of course, the same tensions that infected the pre-fevered world seep into that mall and, before long, Candace is looking for the emergency exit. Ling Ma is an assured and inventive storyteller; believe me, I've only given the lightest of plot summaries here. She's also deft at making the familiar strange, such as when Candace decides to take advantage of the eerie pleasures of a fever-struck New York and browses by flashlight through the deserted Strand bookstore; or, luxuriously, eats her brown bag lunch alone in a booth of the vacant Bemelmans Bar. Like the best speculative fiction, Severance also aims for more than chills and thrills: without being preachy, Ling Ma's story reflects on the nature of human identity and how much the repetitive tasks we perform come to define who we are. That's why the images of the fevered in this novel are not only terrifying, but poignant: the fevered mother who keeps setting dinner dishes down amidst rotting food; the fevered taxi cab driver who'll keep on driving until gas runs out; and even un-fevered Candace herself, who has such trouble breaking away from the daily round of a job she doesn't even like. Ma's vivid apocalyptic novel is something of a sardonic wake-up call. After all, if the mythical Shen Fever struck the planet tomorrow, isn't it likely that many of us, once infected, would "loop indefinitely" by staring at a screen, repetitively texting or typing on a keyboard until the end drew near? This is FRESH AIR. 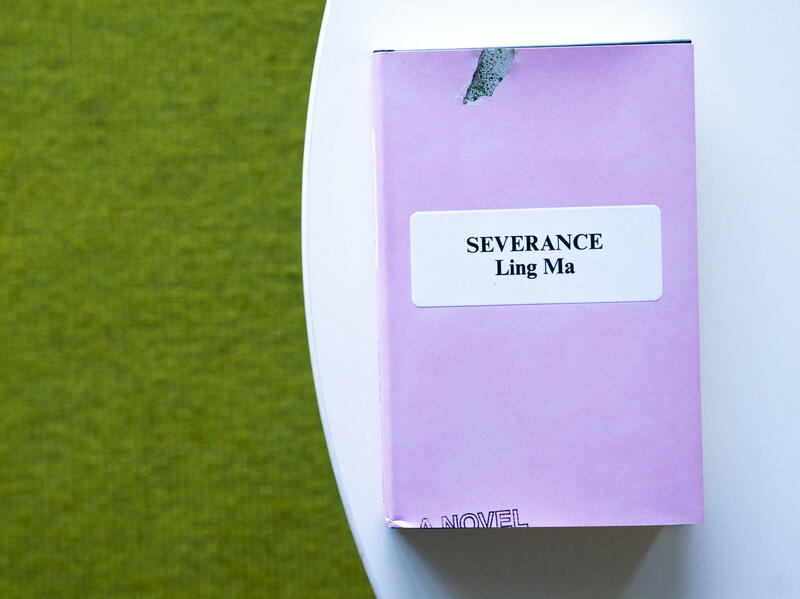 "Severance" is the name of an apocalyptic novel by debut novelist Ling Ma. And our book critic, Maureen Corrigan, says that ominous title refers to more than just the loss of a job. 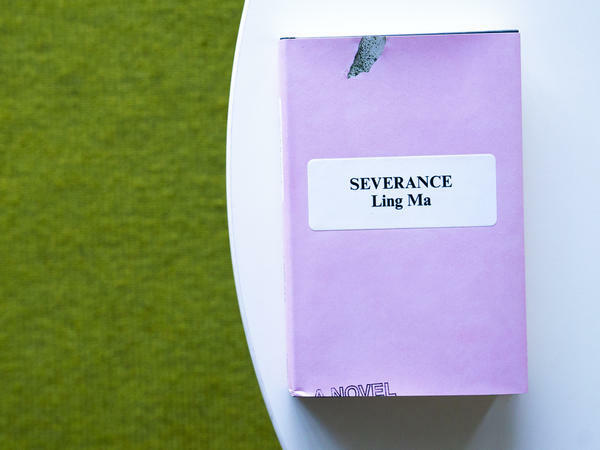 MAUREEN CORRIGAN, BYLINE: There's a sentence at the beginning of Ling Ma's standout debut novel "Severance" that stopped me cold. When you wake up in a fictitious world, one character tells another, your only frame of reference is fiction. Lots of readers these days share the feeling that fiction, specifically apocalyptic fiction, best captures the mood of these precarious times. I say that, and yet I'm not usually drawn to apocalyptic fiction. It's often somber and violent, and I guess I'd rather read stories where things get better rather than worse. Ling Ma's "Severance," however, is an unusual apocalyptic novel - satiric and playful, as well as scary. It lends readers the assurance that humor will linger even as the world winds down to an end. The premise of "Severance" is that America and much of the rest of the world has been struck by something called Shen Fever, a fungal disease that originated in the factories of Southern China. Once infected, the fevered, as they're called, forget to eat or bathe. Instead, they loop indefinitely until they die, performing rote tasks like folding sweaters or vacantly turning the pages of a book over and over. The narrator who's describing this horror for us is named Candace Chen. Candace is a rootless, first-generation American. Her parents, who emigrated from China, are dead. And after college, Candace moved to New York, telling us she was carried by the tides of others. Eventually, Candace landed a job supervising the production of made-to-order Bibles, like the outdoors Bible housed in a lightweight, steel case and the alternative Bible featuring a blank cover and packaged with Sharpie markers for the alt-Christian teens to decorate however they want. Five years limp by, during which time Candace sustains a tepid relationship with her slacker boyfriend in Brooklyn and also curates her photo blog called New York Ghost that she fills with images of forgotten sights in the city. The irony is that when Shen Fever hits, and Candace, for lack of better options, accepts an enormous bonus to stay in New York and keep the corporate headquarters open, New York Ghost becomes a vital link for survivors around the world to see updates from the increasingly empty city. When Candace finally rouses herself from her passivity, she's startled to realize that she may well be the last uninfected person in New York City. That's when she steels herself to walk through the mile-and-a-half pitch-dark Lincoln Tunnel to escape to the mainland of New Jersey. Those events take place in flashbacks to the opening years of the 21st century. In the present time of "Severance," 2005 or so, Candace has already fallen in with a small band of survivors, all apparently immune to Shen Fever, who shelter together in a colossal Midwestern shopping mall, availing themselves of the staples of the food court and the pungent cleansers in Bath & Body Works. But, of course, the same tensions that infected the pre-fevered world seep into that mall, and before long, Candace is looking for the emergency exit. Ling Ma is an assured and inventive storyteller. Believe me; I've only given the lightest of plot summaries here. She's also deft at making the familiar strange, such as when Candace decides to take advantage of the eerie pleasures of a fever-struck New York and browses by flashlight through the deserted Strand Book Store or luxuriously eats her brown-bag lunch alone in a booth of the vacant Bemelmans Bar. Like the best speculative fiction, "Severance" also aims for more than chills and thrills. Without being preachy, Ling Ma's story reflects on the nature of human identity and how much the repetitive tasks we perform come to define who we are. That's why the images of the fevered in this novel are not only terrifying but poignant - the fevered mother who keeps setting dinner dishes down amidst rotting food, the fevered taxi cab driver who'll keep on driving till gas runs out and even unfevered Candace herself, who has such trouble breaking away from the daily round of a job she doesn't even like. Ma's vivid apocalyptic novel is something of a sardonic wake-up call. After all, if the mythical Shen Fever struck the planet tomorrow, isn't it likely that many of us, once infected, would loop indefinitely by staring at a screen, repetitively texting or typing on a keyboard until the end drew near? GROSS: Maureen Corrigan teaches literature at Georgetown University. She reviewed "Severance" by Ling Ma. Tomorrow on FRESH AIR, my guest will be Andre Holland. He's starring in the new Stephen King-inspired series "Castle Rock." In the Oscar-winning film "Moonlight," Holland played the adult Kevin, who has become a cook. In "Selma," he played Andrew Young. He's now in London starring in "Othello." We'll talk about acting and about growing up in Alabama, where his parents were voting rights activists. I hope you'll join us. FRESH AIR's executive producer is Danny Miller. Our senior producer is Roberta Shorrock. Our interviews and reviews are produced and edited by Amy Salit, Phyllis Myers, Sam Briger, Lauren Krenzel, Heidi Saman, Mooj Zadie, Thea Chaloner and Seth Kelley. Therese Madden directed today's show. I'm Terry Gross. (SOUNDBITE OF TRAFFIC QUINTET AND ALAIN PLANES' "THE TREE OF LIFE") Transcript provided by NPR, Copyright NPR.